I took only one picture from the backroads drive from Wilmington to Quechee, and part of me regrets that I didn't take more. We didn't see stunning scenes that demanded I pull the car over, and in many cases I wouldn't have been able to stop for a picture anyway. But even if we didn't see vistas that scored a 9 or a 10 that demanded to be photographed, we saw a whole lot of almost-photo-worthy 7s and 8s of tree-lined roads, verdant hillsides, and quaint little towns, each with their small white wooden church. The cumulative effect of seeing all that beauty over the course of hours was quietly splendid in a way that I don't know how to convey with a few pictures, even if I had taken them. 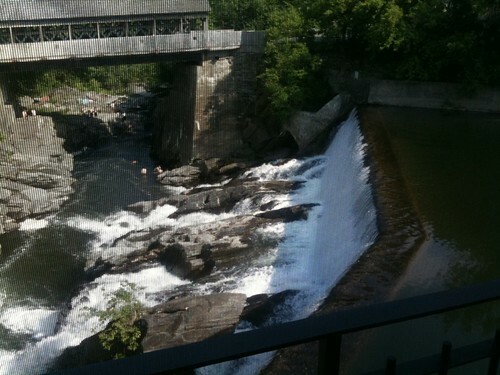 After a few GPS challenges, we finally made it to Simon Pearce in Quechee, Vermont. Simon Pearce is a glass factory, but they also have a very nice restaurant on the premises. It was an enormously scenic dining experience, because the building is on the side of the river that powers the glassworks. This picture is not as good as I would like because I was taking it through the screen, but I'm including it so that I can say "this was the view from our table". 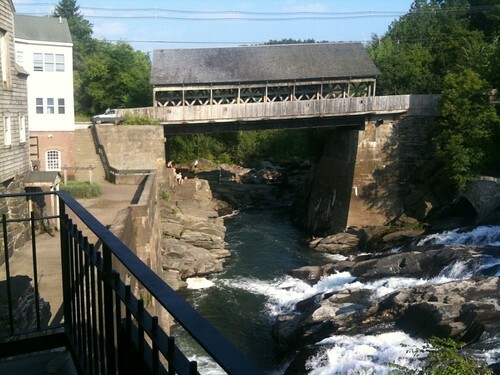 During our meal, we saw kids jumping off the rocks into the water, and saw a few bold kids swinging out hand-over-hand on the underside of the bridge to drop from the bridge into the water below. We felt a worry on their behalf that they did not seem to feel themselves. The first thing we were served was excellent bread. 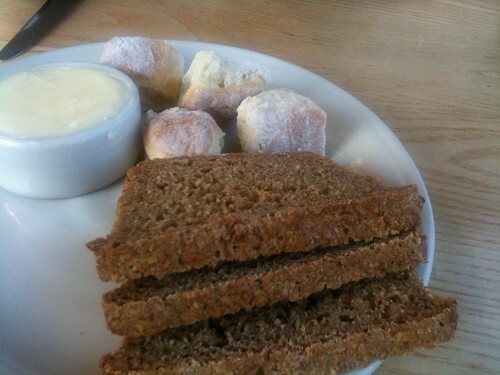 The Ballymaloe bread was simply a good, hearty brown bread, but the little cheddar scones were fabulously light and tender. We both ordered a cup of the cheddar soup. 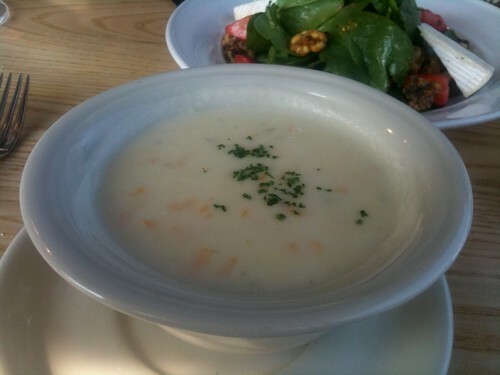 The soup was splendid with a very rich broad flavor that played across my whole mouth. We bought the Simon Pearce cookbook on the basis of the cheddar soup and the cheese scones. We then shared the strawberry, brie, and spinach salad. I felt that the best part of this was the strawberries and the candied walnuts. 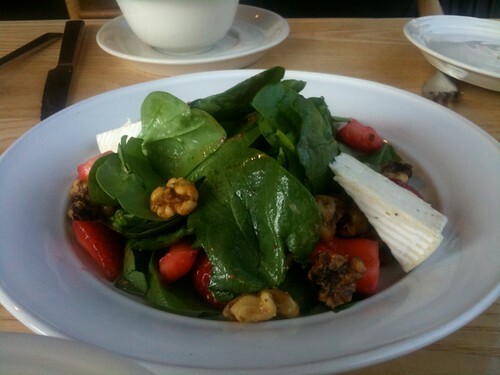 The brie had some ripe, earthy flavors that I wasn't expecting from my supermarket-brie experience; they were probably intended by the creator, but I felt the flavors were a bit too brash to meld well with the strawberries and walnuts. We shopped a bit in the glass shop, but the prices were too much for me to feel cheerful about. From there, we drove to Dorset. We stopped at a farm stand/grocery store because I had fantasies of snacking on locally grown fruits, but nothing seemed to be in season yet. 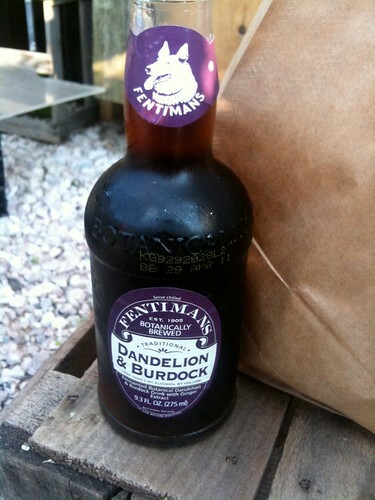 I bought a bottle of Fentiman's Dandelion and Burdock Soda, because I'd never had any such thing before. I don't have good ways to describe the flavor. I felt it had a big round flavor that reminded me of a bubble-gum-flavored soda - but Lori didn't agree with that description at all. I could taste the ginger and anise, though I found those flavors just details. I did like the flavor; I would certainly get it again if I saw it for sale, but I probably wouldn't get a six-pack, even for a party.